I was lucky enough to be sent a bundle of products from Mixa recently and I want to share my thoughts on them with you today. 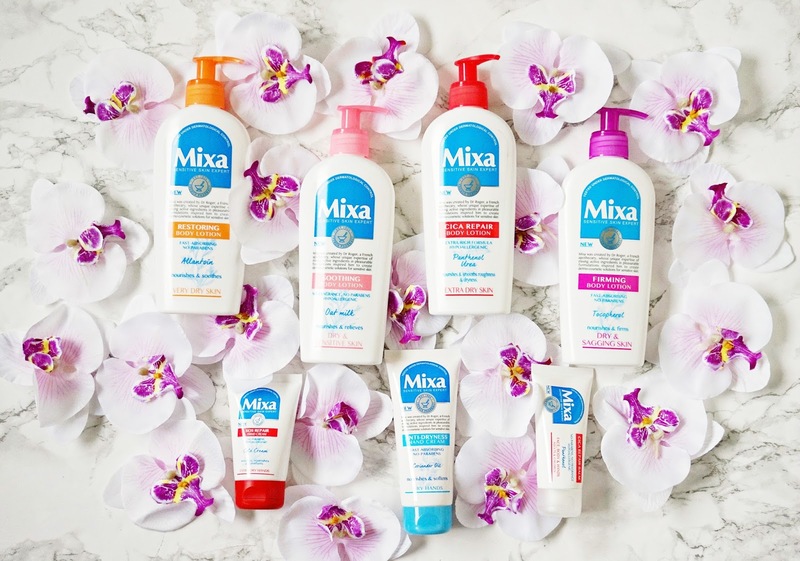 Mixa is a French brand, created by a pharmacist in 1924, which launched in the UK and Ireland in 2017. We all know that French pharmacy products are top quality so it's brilliant that they are more accessible to us now. There are five body lotions in the range, four of which I have tried: Soothing, Restoring, Firming, Anti-Dryness and Cica Repair. Obviously you choose which one will suit you best depending on the condition of your skin. The soothing option contains Oat Milk and is free from perfume, making it perfect for sensitive or stressed skin. The restoring option contains Allantoin, which is known for its moisturising abilities, making it perfect for very dry skin. The firming option contains Tacopherol, which is a form of Vitamin E, known for its nourishing properties. Finally, the repair option contains Panthenol and Urea, both of which are known for their soothing and hydrating properties. What all of these body lotions have in common is that they are fast-absorbing, light in texture and effective. They are all priced at £6.49 for 250ml and they all come with a pump. There's no excuse not to moisturise your body daily with these lotions because they melt into the skin so quickly that there is no down time before getting dressed! Cica Repair Balm is a product that should be in every household because it is suitable for so many skin conditions - dry heels and elbows, on cuticles, to soothe itchy skin - basically anywhere on the face and body of both adults and children and IT WORKS! My husband sometimes gets patches of eczema and he has used it for that purpose, I have use it on my knees and elbows and I also used it on my niece's hands when she said that they were itchy and she made it worse by scratching! The SOS hand cream is ideal for those who work outdoors or who suffer from extremely dry and rough skin on their hands. It immediately soothes the skin and it feels as though there is a protective barrier over them, yet it doesn't feel greasy. The anti-dryness hand cream is lighter in texture but equally as effective in terms of nourishing the hands without leaving them feeling at all greasy - everything I look for in a hand cream! Overall, I cannot rave about this range enough - everything is both effective and affordable and the body lotions are now staples in my routine. They are sold in Superdrug and are regularly on offer - I highly recommend checking them out! Have you tried any Mixa products? Id love to hear your thoughts! All products are bought by me, unless otherwise stated. All of these products were kindly sent to me but I have bought some of them previously with my own money - the love is real! Opinion is always my own.